Chamomile tea might help hydrate you when you have a stuffy nose and cough, but as of 2011, there is no scientific evidence that the herb itself will help ease your symptoms. A stuffy nose and cough can be features of the common cold or other medical problems. Consult your doctor about using chamomile to treat any medical condition. Since ancient Egypt and Rome, people have been using two types of chamomile medicinally. The types are German and English, also known as Roman, chamomile. 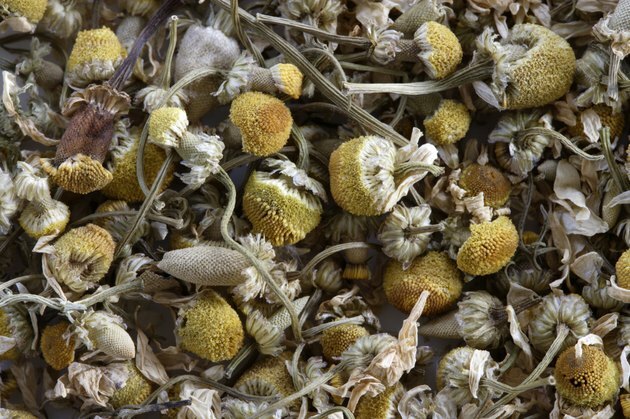 Sore throats, chest colds, allergies, gingivitis, indigestion, irritable bowel syndrome and anxiety have been treated with chamomile, as well as muscle spasms, skin problems, ulcers, colic and infections. According to the University of Maryland Medical Center, German chamomile might help reduce inflammation and muscle spasms, aid sleep and help wounds heal faster. It might also have antibacterial, antifungal and antiviral properties. Human studies are too limited to substantiate any of these claims. Avoid chamomile if you are allergic to ragweed, asters, chrysanthemums or members of the daisy family, as chamomile could trigger an allergic reaction. A stuffy nose and cough might be symptoms of the common cold. Other symptoms might include sneezing, sore throat or headache. Cold viruses spread through droplets released when sick people cough and sneeze, or blow their noses. According to the New York Times, getting enough rest and drinking lots of fluids are the best methods to cure a cold. However, if you are sick with a cold for longer than a week or have additional symptoms, you might have a more serious illness, and should call your doctor. While there is no evidence that chamomile tea will help your stuffy nose and cough, moderate amounts of the tea is probably safe for most people. Many non-caffeinated fluids can be good for helping flush bacteria out of your system, and sipping the fragrant tea may comfort you. Chamomile tea is widely available both as loose tea and prepared in teabags. Organic chamomile tea is grown and harvested without the use of chemical herbicides or pesticides. Steep a teabag or ball of loose tea in boiling water for 5 minutes, or until the infusion reaches the strength you desire. You can also grow your own chamomile plants for tea. These fast-spreading perennial herbs emit a strong scent in the garden or in pots. Flavor chamomile tea with honey to add sweetness. Other remedies that folk wisdom prescribes for a stuffy nose and cough include echinacea tea, zinc supplements, vitamin C and chicken soup. Vitamin C may not cure a cold, but people who take it regularly might have milder symptoms and suffer for fewer days. Chicken soup might also help, says the New York Times, due to the fluid, salt and heat it contains. If you take a zinc supplement within 24 hours of conceiving your cold, it may not last as long.